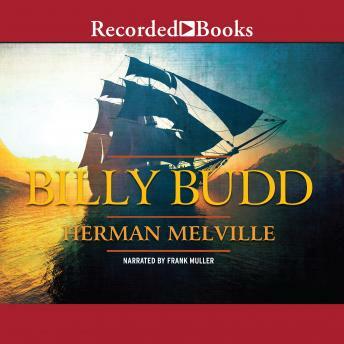 Critically acclaimed for more than 100 years, Herman Melville's sea tale, Billy Budd, is considered to be one of the small masterpieces of American fiction. An engaging plot on the surface, the exciting yarn set in 1791 also raises profound questions about the very nature of man himself. Handsome, young Billy Budd is well-liked by the other sailors aboard the British warship, the H.M.S. Indomitable. But the ship's cruel Master-at-Arms, insanely jealous of Billy's popularity, falsely accuses Billy of fomenting mutiny. Attempting to defend himself, the young sailor strikes out-only to find himself facing an even more serious charge. His years working on whaleships enabled Herman Melville to create realistic characters in authentic settings. The battle between good and evil, conscience and honor bursts from the page with Frank Muller's stirring narration. Herman Melville tends to deviate from his stories to add information that he deems important. This to me detracts from the story so that when he picks it back up, you have to remember the point where he left off from. The reader does a wonderful job of adding meaning to the often difficult prose, which was the style in the days of Melville, such that even through I did not enjoy the story, the reader made it as interesting as it could be.